Stream Deck Mini packs the same punch as Stream Deck – in an ultra-compact package that’s easier on your pocket. 6 fully customizable LCD keys poised to trigger unlimited actions. One-touch tactile operation. Instant visual feedback. Advanced yet easy-to-use software. Traditionally this level of studio control was exclusive to mainstream entertainment broadcasters. Now, it’s at your fingertips. So you can maximize your production value and focus on what matters most: your audience. Gone are the days of navigating windows to trigger an action, and relying solely on automated plugins to expand your production value. Now, you hold the power to pioneer a new era of content creation, and lead your audience to uncharted frontiers of inspiration. Now, you’re in control. 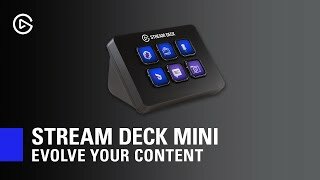 More links for "USB Customisable Stream Deck Mini (10GAI9901)"